I think they wore the ghost shirt or ghost dress for the first time that day. I noticed that these were all new and were worn by about seventy men and forty women. The wife of a man called Return-from-scout had seen in a vision that her friends all wore a similar robe, and on reviving from her trance she called the women together and they made a great number of the sacred garments. They were of white cotton cloth. The women’s dress was cut like their ordinary dress, a loose robe with wide, flowing sleeves, painted blue in the neck, in the shape of a three-cornered handkerchief, with moon, stars, birds, etc., interspersed with real feathers, painted on the waists, letting them fall to within 3 inches of the ground, the fringe at the bottom. In the hair, near the crown, a feather was tied. I noticed an absence of any manner of head ornaments, and, as I knew their vanity and fondness for them, wondered why it was. Upon making inquiries I found they discarded everything they could which was made by white men. 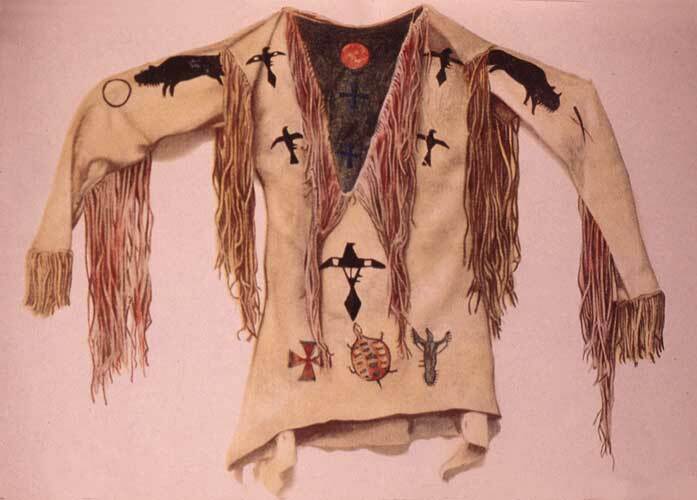 The ghost shirt for the men was made of the same material-shirts and leggings painted in red. Some of the leggings were painted in stripes running up and down, others running around. The shirt was painted blue around the neck, and the whole garment was fantastically sprinkled with figures of birds, bows and arrows, sun, moon, and stars, and everything they saw in nature. Down the outside of the sleeve were rows of feathers tied by the quill ends and left to fly in the breeze, and also a row around the neck and up and down the outside of the leggings. I noticed that a number had stuffed birds, squirrel heads, etc., tied in their long hair. The faces of all were painted red with a black half-moon on the forehead or on one cheek. They kept up dancing until fully 100 persons were lying unconscious. Then they stopped and seated themselves in a circle, and as each recovered from his trance he was brought to the center of the ring to relate his experience.